Hello. It has been a while since I barked--er, spoke--here. My name is Biscuit. I'm a dog, part of Carrie Kennersly's family. 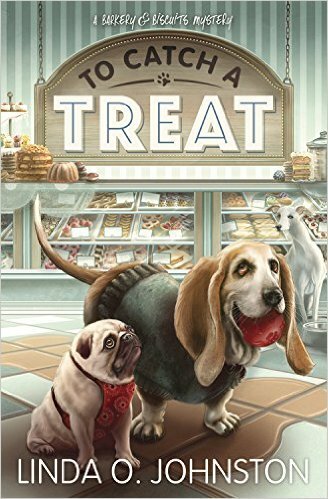 She's the person whose stories are told in the Barkery & Biscuits Mysteries. Carrie says that the second of those stories, TO CATCH A TREAT, will be published in May, whatever that means. From what I've heard--and, yes, my dog hearing is great, even though I don't always understand human speak--it involves dognappings. That's terrible enough. But those dognappings aren't for ransom so the stolen pups' families can pay to get them back. No, what Carrie figures out is that the dogs that are taken are what humans call purebreds, and those horrible dognappers are reselling them to other humans who are looking for a new dog. And as happens in Carrie's stories, a human gets killed. Not a dog, thank heavens. They may get stolen but they're not hurt--physically, at least. Do you want to know the background of the stories from my perspective? I did bark--er, talk--about it the last time I was here, but let me try it again. Carrie's my human. She brought me home a while ago after the humans who supposedly owned me left me at the veterinary clinic where Carrie works, and we've been close ever since. I'm not one of those purebreds but a mix between those they call toy poodles and those they call terriers. I'm gold in color, and my fur is fuzzy. I have fun hanging out most days in one of Carrie's stores--Barkery & Biscuits, where she sells healthy and scrumptious dog treats she created as a veterinary technician. She still works part-time as a vet tech at the clinic where she takes me if I'm sick or she says I need shots. I also spend time there at the doggy daycare place at the back when she's on duty. Oh, and right next door to the Barkery is Carrie's other shop, Icing on the Cake, where she bakes stuff for humans, but I'm not invited to visit there. Those are the basics. Oh, and yeah, Carrie has started seeing one of the vets at her clinic when she's off duty--Dr. Reed Storme. He's a nice guy, and I like his dog Hugo, who's what humans call a Belgian Malinois. Anyway, this story of Carrie's, like the first one, is worth reading, even though I don't know how to read. 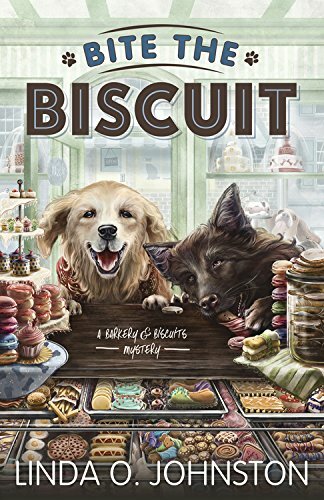 She tells me that the first one, BITE THE BISCUIT, was a finalist in the fiction category of the Dog Writers Association of America's Maxwell Awards, whatever all that means. My suggestion again? Stop by our stores in Knobcone Heights, California, buy people treats for you and dog treats for your best friend. TO CATCH A TREAT, the second Barkery & Biscuits Mystery by Linda O. Johnston, will be a May 2016 release from Midnight Ink. Great post from a dog's view! I just ordered Bite the Biscuit. I have the first superstition mystery and would like to get Knock on Wood sometime. I also own some of the Kendra mysteries. On Linda's behalf, I'm delighted to hear that, Michelle. On my behalf, too!